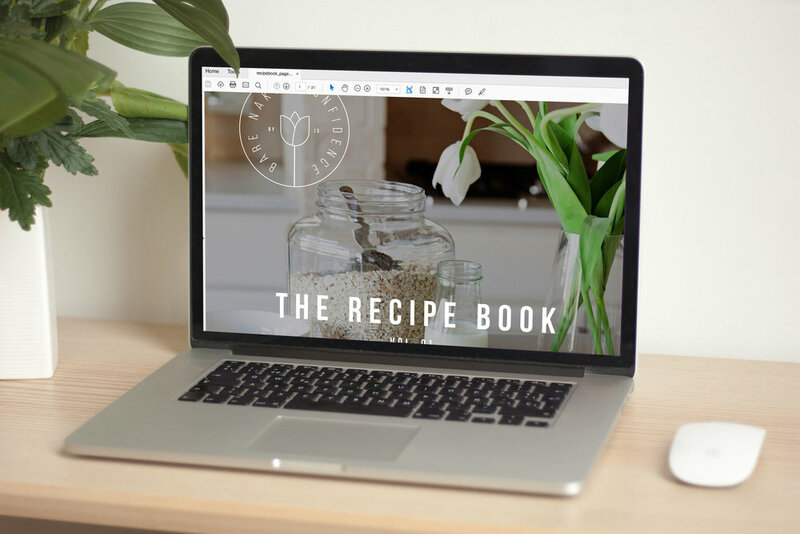 Want to know more about what you can find in the The Recipe Book with Bare Naked Confidence? Read below to learn how Jen curated her favorite recipes and created a go-to resource for YOU! WHAT ARE YOUR THOUGHTS ON BEING VEGAN AND/OR VEGETARIAN? opinion, however I just love a good meat and cheese board. Girls gotta live. dense meals. Also… balance and moderation above all. WHAT'S YOUR IDEA OF HEALTHY FATS/CARBS? Good source of healthy fats: avocado, coconut oil, olive oil, ghee, whole eggs, fish, nuts. Good source of carbs: sweet potatoes, quinoa, legumes, whole grains. Good source of protein: (organic) meat, chicken, fish, eggs, beans, yogurt, nuts, seeds. for muscle recovery and growth. My favorite protein powder & protein drink brand: Orgain. HOW MANY MEALS/SNACKS DO YOU EAT DAILY? Typically 3 main meals, with 2-3 healthy snacks throughout the day. My go-to healthy snacks are found right in The Recipe Book! WHAT DO YOU DRINK on a daily basis? Water, water with lemon, sparkling water… and then more water. That is IT. I do drink caffeine and alcohol (in moderation… usually) but NEVER with any added sugar. EVER! (sugary cocktails = hangovers from hell).